What better way to spend the Columbus Day holiday than playing soccer? 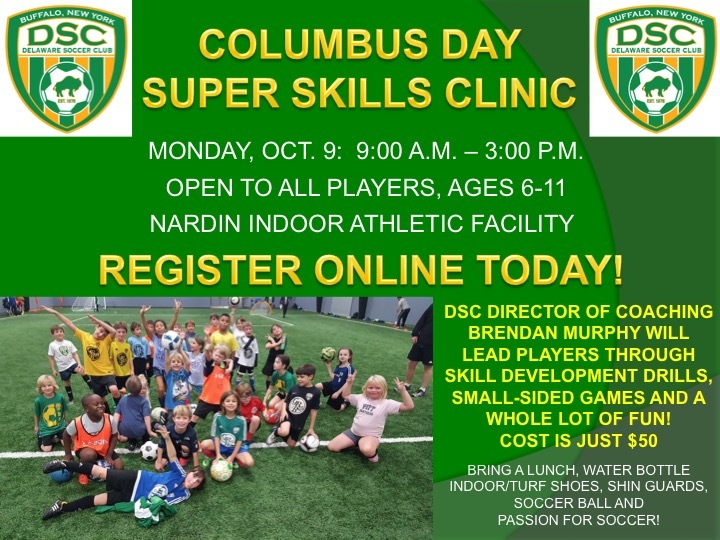 Register today for Monday's U6-U11 Columbus Day Super Soccer Clinic held indoors at the Nardin Academy Athletic Center! Director of Coaching Brendan Murphy and a group of highly qualified trainers and coaches will be hosting a Super Soccer Skills clinic from 9am-3pm. The clinic will take place indoors at the BEAUTIFUL Nardin Indoor Athletic Complex located at 1803 Elmwood Avenue. Cost is just $50. Please bring your lunch, water bottle, shin guards, indoor/turf shoes (no cleats! ), soccer ball and passion for soccer!